Norway’s state broadcaster ran a TV program about wood burning in response to this best selling book. It featured an eight hour view of a fire in a wood stove with a glass viewing panel. One viewer, niesa36, wrote on the Dagbladet newspaper website: ‘I couldn’t go to bed because I was so excited. ‘When will they add new logs? Just before I managed to tear myself away, they must have opened the flue a little, because just then the flames shot a little higher. What a title! You just have to read it – or at least “leaf” through the pages. I’m a former logger and have nearly always had a wood burning stove in our house. I’ve chopped, stacked, and dried wood for a large part of my life. I absolutely had to read this book to compare my method with the Scandinavian way. He starts at the forest. All of the common northern hardwoods (and pine, spruce, and fir) get a small essay. Most also grow in the forests around Ottawa and we would recognize some of them by sight, especially the “queen”. Next is tools; different models of chain saws are identified and described. Seven kinds of axes are identified and their traits are proclaimed. We amateurs in North America tend to get by with two, at the most three. A chapter is titled “The Chopping Block”. What kind of wood makes a good chopping block, how big, how tall, how to treat them, etc. Now we get to the meat of the story – the splitting and stacking. 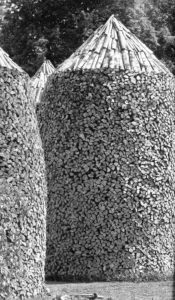 A well stacked woodpile is a source of pride to the Scandinavian firewood user. 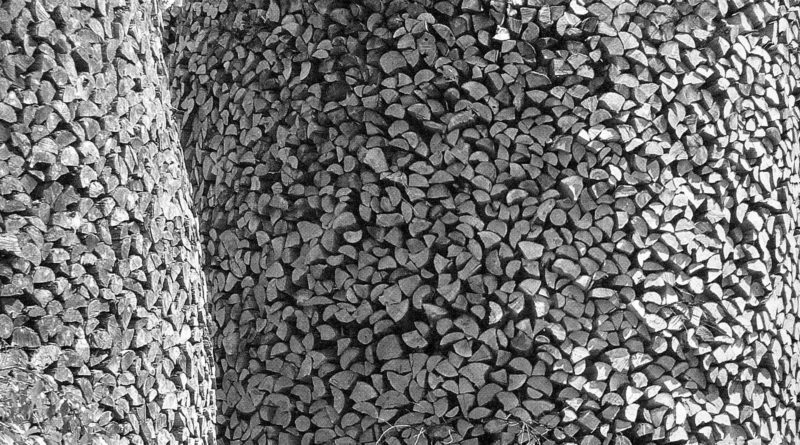 To illustrate how important the woodpile is, Lars describes different styles of stacking. He features two pictures of woodpiles that are stacked in such a way as to make sculptures. Another illustration shows a young man posing in front of a two story house completely encased (except for doors and windows) in a wood pile. He won the Ark National Firewood Stacking Competition in 2012! They have wood stacking competitions! I told you they were serious. Do you want to know about Scandinavian wood stoves, current and historical? He has a chapter. Do you know that, in order for wood to dry properly, trees should be cut no later than the day when one can start to see the earth through the thawing snow. Of course you do – now. Published as Hel Ved by Kagge Forlag AS in 2011; translated by Robert Ferguson and published in English by MacLeHose Press (UK) 2015.